Facts about Italian Greyhound Dogs, "Scientific name for Italian Greyhound Dog, or domestic canine, is Canis lupus familiaris". The Italian Greyhound Dog is a miniature variety of dog that comes under the sight hound category, occasionally called with the short form as I.G. When fully grown, the Italian Greyhound Dog breed attains the maximum height that lies between 13 and 15 inches (33 to 38.1 cm), with the maximum body weight, ranging from 6 to 11 pounds (2.7 to 4.9 kg). Though Italian Greyhound Dog breeds belong to the toy category derived from their weight, they are bigger than other dogs in the group, owing to their slim bodies. A Italian Greyhound Dog is an omnivore, (definition-they eat both other animals and plants). All Dogs are direct descendants of wolves. The Italian Greyhound Dog breed appears with a small body, with slim, fine-bones. The Italian Greyhound Dogs have a long and slender head, approximately even at the peak with a muzzle that narrows to a point, with a slight stop. They have a brown or a black colored nose, according to their coat color. The teeth of the Italian Greyhound Dog breed gather in a scissors bite. They have dark average-sized eyes, and have tiny ears that fold back down the head, and while the dog is alert they slant to the right. These Italian Greyhound Dog breeds have a long neck and they have a deep and narrow chest. The front legs of the breed are straight that appear with the removed dewclaws. The elongated, low-set tail is slender, shrinking to a point. The small, shiny fur comes in different colors, such as slate gray, gray, red, blue, fawn, black, cream, or white. The Italian Greyhound dogs appear white in color spots or color with white spots on the feet and chest. A Italian Greyhound Dog’s mouth can apply approximately 150 to 200 pounds of pressure per square inch and an American Pit Bull Terrier, German Shepherd Dog and a rottweiler can have 320 LBS of pressure on avg. All dogs are identical in makeup big or small– 42 permanent teeth and 321 bones. Italian Greyhound Puppies have 28 teeth and when they become adult dogs they have 42 teeth. The Italian Greyhound Dog breed is keen, playful, loving, clever and kind-mannered. Generally, this dog breed is obedient and desires nothing more than to satisfy its owner. It is responsive to the tone of the voice of a person and will not pay attention if it detects, which is stronger minded than its possessor. However, the Italian Greyhound Dog will not react well to cruel discipline. These dog breeds are aloof with strangers. The Italian Greyhound Dog can be timid and high-strung if they are overprotected, and do not get adequate exercise, including an everyday pack walk. The Italian Greyhound Dog breed is very fast and active and also capable of climbing. Italian Greyhound Dogs have two times the amount of ear muscles than people. A Italian Greyhound Dogs can hear a sound at four times the distance of a human. Sound frequency is measured in Hertz (Hz) Def-Hertz is the measurement of frequency, explicitly it's one cycle per second. The higher the Hertz are, the higher the pitched the sound is. 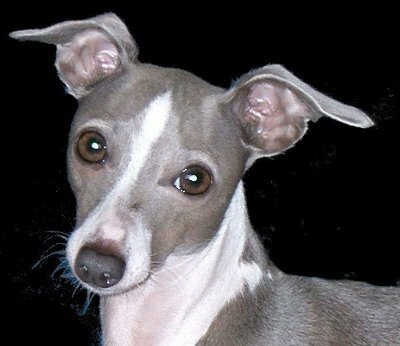 Italian Greyhound Dogs hear best at 45,000 Hz to 65,000 Hz, while humans hear best at around 20 Hz to 20,000 Hz. The average lifespan of the Italian Greyhound breed ranges from 12 to 15 years. When purchasing a Italian Greyhound dog from a breeder, make sure to find a good breeder with references, check at least two to three of the puppies that were purchased from this breeder. In 1886 the Italian Greyhound was recognized by the (AKC) American Kennel Club. Italian Greyhound Dog’s nose prints can be used to identify them, their nose prints are like a humans finger print. A Italian Greyhound Dog smells more than 1,000 times stronger than that of a human. A Italian Greyhound Dog’s nose, secretes a thin layer of mucous that helps it absorb scent, after that they lick their noses and sample the scent through their mouth. The number one heath problems amongst Italian Greyhound Dogs is obesity, so always make sure your Italian Greyhound Dog doesn't get to fat. Many foot problems that Italian Greyhound Dogs have are just an issue of long toenails. Italian Greyhound Dogs pant to keep cool with 10 to 35 breaths per minute with an average of 24 breaths per minute. A large dog breed resting heart beats between 60 to 100 times per minute, and a small dog breed’s heart beats on average between 100 to 140 pant a lot.Italian Greyhound Dogs sweat glands are between their paw pads.